Greater Binghamton children and their parents can learn everything they need to know about making healthy food choices when they sign up for a free program from the UHS healthcare system. “UHS Stay Healthy Kids” offers presentations in four sessions that are designed to teach youngsters ages 5 to 18 how to eat well and stay active. Emphasizing the importance of fruits and vegetables in the diet, the program employs Rex and Roxy, characters developed by “B.C.” cartoonist Mason Mastroianni, to bring home the message. Families get tips on how nutritious food can taste good, help a young person feel better and do better in sports, and lead to greater well-being for life. The program follows the guidelines of the State of Maine’s pioneering “Let’s Go!” approach, which emphasizes the eating of five fruits and vegetables every day, as well as two hours or less of recreational screen time, one hour or more of physical activity and zero consumption of sugary drinks. It also recommends turning off screens during family mealtimes, keeping TVs and computers out of the bedroom and no screen time before age 2. After signing up, parents and their children or teenagers attend a series of four free sessions that provide tips on eating right, staying active and achieving overall wellness. 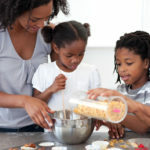 Parents learn how to prepare healthy choices at mealtime, eat the same foods as their children to set a good example, and discover physical activities that can be enjoyed as a family. Each family gets individualized sessions tailored to their specific needs, including any allergies or dietary restrictions, and follow-up calls from Stay Healthy staff are made to the home for the rest of the year. Nationwide, childhood obesity has more than doubled in children and quadrupled in adolescents in the past 30 years, according to the Centers for Disease Control and Prevention. The percentage of children ages 6 to 11 who were obese increased from 7 percent in 1980 to nearly 18 in 2012. In 2012, more than one third of children and adolescents were overweight or obese. 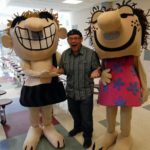 Rex and Roxy, “Stone Age children” who make healthy food choices and who have been depicted in logos, cartoons, TV commercials and an animated video, are popular role models with schoolchildren throughout Greater Binghamton. The characters were created by Mr. Mastroianni, a Binghamton-area native who draws the nationally syndicated “B.C.” comic strip and who has helped promote Stay Healthy Kids. Ms. Miller and Ms. Farmer often don Rex and Roxy costumes and give presentations at schools and health fairs to connect with youngsters and raise community awareness about the program. And the Rock On Café, a lunch program at the Broome-Tioga Board of Cooperative Educational Services school, features Rex and Roxy’s message about good food choices. Stay Healthy Kids is funded partly by UHS and partly by dollars from a New York State Childhood Obesity Grant.